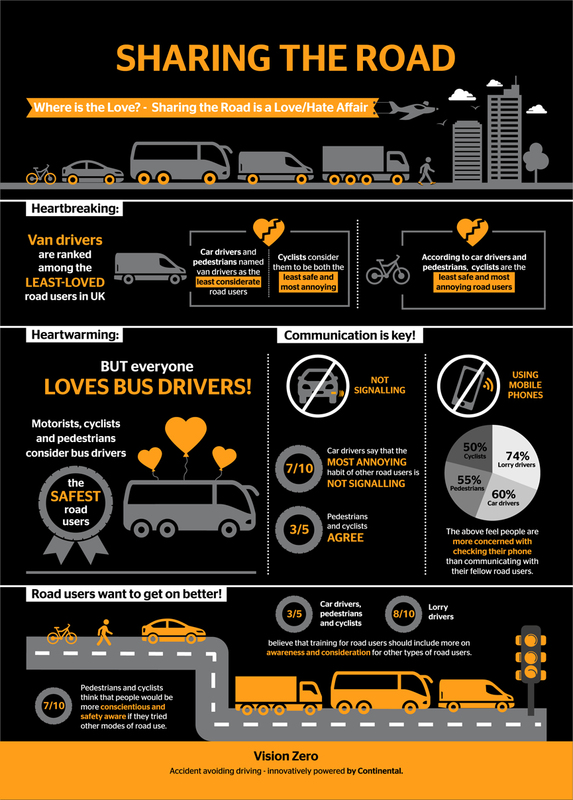 Bus drivers are the UK’s most loved professional drivers, according to a new study by Continental Tyres. UK motorists were asked what they thought of the behaviour of other road users, and of all professional drivers, bus drivers came out on top. The national study was set up to better understand how road users feel about the other groups with which they share the road. It asked cyclists, pedestrians, passenger car drivers and professional drivers, including van, taxi, bus and HGV to list their motoring peeves and genuine safety concerns, based on their experience within the UK road network. Both cyclists and car drivers voted bus drivers as more considerate and safer than their truck and van driving colleagues, with 25% of car drivers and almost 20% of cyclists voting bus drivers the safest road users. HGV drivers also fared well in the findings, with 21% of car drivers stating they felt most safe around truck drivers. From the truck drivers’ perspective, cyclists were their main cause for concern, with 41% feeling that cyclists were the least safe road user group. However, van and taxi drivers proved to be at the bottom of the popularity league overall. Cyclists and car drivers both ranked van drivers the least safe, while 33% of professional truck drivers stated taxi drivers were the least considerate on the road. It seems general poor driving, and poor signalling top the list of pet peeves across all road users. A huge eight out of ten commercial vehicle drivers said harsh braking and late indication annoys them most about other road users, while mobile phone use came in a close second, ranked as the top peeve by 75% of professional drivers. Continental Tyres, which supplies tyres to all of the road user groups, commissioned the study as part of its Vision Zero Initiative, which aims to eradicate road accidents and promote universal road safety. Mat Wilkinson from Continental Tyres said: “The way people use the roads clearly effects how they feel about other drivers, and often those who use the roads the most for professional purposes, receive more criticism. This is especially evident as our road networks become busier than ever before. “While it is useful to understand each group’s concerns, it is beneficial to look at how we can help each sector, to make things easier for drivers, and ultimately make roads safer for all." One unifying aspect shown by the research is that better education could be the answer. In fact, on average 60% of each group of drivers agreed that experiencing how it feels to use the road in a different vehicle would help make drivers more considerate, and that training should include how to drive with more care for fellow road users. Mat Wilkinson added: “Although it seems on the surface that we are a nation divided by who we are and how we use the roads, there is more that connects drivers than separates them. It certainly seems there is a willingness to learn about the challenges other road users face, and rather than tougher penalties, UK drivers are pinpointing education as the key to better sharing of our roads.